The MeCP2 protein binds methylated cytosine residues in DNA. In 1999, the MeCP2 gene was discovered to be altered in many cases of the autism spectrum disorder Rett syndrome. Since then, we have learned much more about the functions of MeCP2 in the mammalian nervous system, including an unexpected role for MeCP2 in mediating responses to certain drugs of abuse. As a whole, this mini-symposium will provide insights into the possible roles of MeCP2 in neurodevelopmental and substance abuse disorders. The combination of observable traits, also referred to as phenotypes, can be influenced by gene expression and environmental factors, including exposure to drugs. Dr. LaSalle began her presentation by discussing the genes related to neurodevelopmental disorders and what they tell us about epigenetics’ role in the development of the social brain. MeCP2, a binding protein known for regulating gene expression, produces one of the essential “readers” of the DNA methylation code, the first layer of epigenetic information in developing neurons. MeCP2 regulates the genes involved in changes to neural activity and growth, as well as the genes that control anxiety and stress response. These genetic mechanisms affect a wide range of neurodevelopmental disorders, particularly autism spectrum disorders. 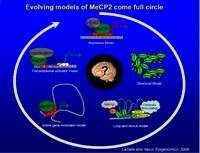 When MeCP2 is deficient, it causes neuronal nuclei to get smaller and chromosome structure to change. Dr. LaSalle and her team of researchers developed a model that allowed them to map the genomic locations of partially methylated domains in human neuronal cells. This mapping helped them determine how much of a role DNA methylation plays in the neuronal nuclear changes that occur during development. These results indicate that the level of DNA methylation and MeCP2 is critical to the development of the human brain, as reduced DNA methylation caused by exposure of MeCP2 mutant female mice to a common chemical flame retardant resulted in a decrease in sociability in their female offspring. This is a classic behavioral characteristic among individuals with autism spectrum disorders and in individuals known to abuse drugs. The effects of cocaine are not limited to individuals exposed to cocaine. They can be transmitted to the user’s offspring through the germ line, even when those generations were never exposed to cocaine, suggesting that the population at risk may be larger than scientists originally estimated. Dr. Sadri-Vakili explained what researchers know about the contribution of epigenetic factors to the risk of cocaine abuse. Using animal models of addiction, the research team demonstrated that drugs cause epigenetic alterations in gene expression that can influence brain development and behavior. Cocaine-induced alterations in the brain are characterized by behavioral, cellular, and molecular events, including alterations in cocaine self-administration and locomotor sensitization to cocaine, increased BDNF expression, increased histone acetylation, and decreased MeCP2 binding. Dr. Sadri-Vakili and her team of researchers used paternal and maternal animal model to characterize these events across multiple generations. 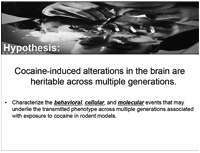 In the first model, male rats self-administered cocaine for 60 days, mated with drug-naïve females, and then behavior and molecular traits were examined in the F1 generation at adulthood. In the second model, pregnant mice received twice-daily injections of cocaine until birth and behavioral and molecular traits of the F1 and F2 generations were examined at development and adulthood. Results showed that male offspring of rodents exposed to cocaine demonstrated a significant change in behavior, brain development, and gene expression in both models in the F1 and F2 generations. More specifically, the male offspring were less sensitive to the rewarding effects of cocaine that was marked by increased levels of BDNF protein and mRNA in the prefrontal cortex. Psychostimulants like cocaine and amphetamine very rapidly enter the brain and increase levels of dopamine. Over the long term, studies show that exposure to psychostimulants results in locomotor sensitization, memory challenges and eventually addiction. However these behavioral changes require chronic exposure to psychostimulants, suggesting that slower biochemical processes may underlie these behavioral changes. Many studies suggest that neural plasticity mechanisms, including changes in the way genetic information is copied into new RNA molecules, are essential in this transition to addiction. Dr. West discussed research measuring the epigenetic mechanisms of chromatin regulation in response to repeated exposure to psychostimulants and its role in these behavioral adaptations. Dr. West and her team of researchers used a mouse model to determine whether psychostimulants act via the MeCP2 protein, which modulates gene transcription, to influence long-lasting behavioral changes. Her results showed that when the MeCP2 is mutated in a way that prevents it from being regulated by psychostimulants, that mice experience more rapid locomotor sensitization to amphetamine and demonstrate increased sensitivity to the rewarding effects of cocaine. These results suggest that MeCP2 limits the rewarding and reinforcing properties of psychostimulants like amphetamine and cocaine. Dr. West explored the implications of this data and what they tell scientists about the molecular and cellular mechanisms that influence the development of addictive behaviors.